This upscale resort is located on the Intracoastal Waterway, directly across the street from the Atlantic Ocean. The spacious guest rooms include a 37" HDTV, lighted vanity area, kitchenette with microwave and complimentary WiFi. Dine at Elements Bistro or order your favorite cocktail from the Lava Tiki Bar and cool off by the outdoor infinity pool. 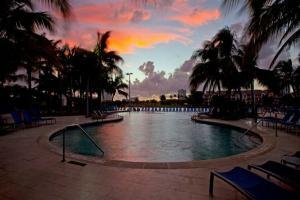 Located about 9 miles from Fort Lauderdale/Hollywood International Airport.